Despite the SNES-era name, Ballz is actually a load of clever fun. The name 'Ballz' didn't exactly instill me with confidence upon first glance - for reasons I imagine to be fairly obvious. However, I'm glad I gave it a try anyway because, as it turns out, this is actually a pretty great mash-up of puzzling and brick-breaking. Oh sure, launching balls at blocks in order to break them before they reach the bottom of the screen sounds easy. The problem is it's all turn-based, so if you aren't mindful of your shots you'll find yourself getting overwhelmed in a hurry. It's not a race. 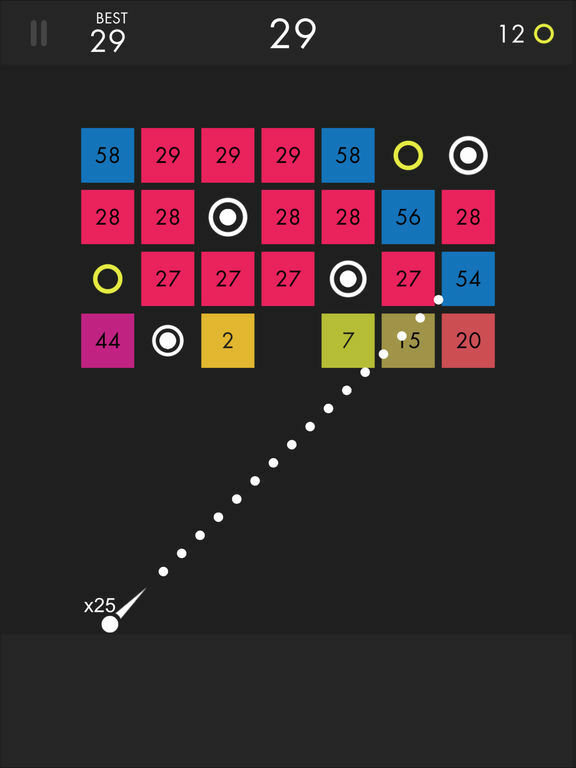 The rows of blocks won't move until every ball you've launched returns to the bottom of the screen. You have plenty of time to decide where you want to focus your fire, and as much time as you want to aim. More balls is always better. Unless things are getting too close for comfort, you're likely better off grabbing as many extra balls as you can as often as you can. The more you have the easier it is to create a tidal wave of destruction that can clear multiple blocks in one shot. Numbers are super important. The number on a block shows how many times it has to be struck in order to be cleared. The higher the number - and oh goodness do the numbers get high - the more work it'll take to get rid of it. Numbers don't recharge. If you can't clear a block with a large number in one turn you can certainly weaken it so that it'll be easier to get rid of later. Try to stay as far away from the bottom of the screen as possible. Your turn won't end and the blocks won't descend until every last ball has touched the bottom of the screen. The longer you can keep at least one of them in motion, the more damage you can do to those pesky things. If blocks get close to the bottom, aim super low. It can be tricky to get the angle just right sometimes, but if the situation is dire you should try to launch balls as close to horizontal a the wall as you can. That way they'll (hopefully) bounce multiple times along the same row and can clear out high value blocks in a single go. Aim for the back. Unless you've got a situation with blocks being really close to the bottom, it's never a bad idea to try and aim your shots behind the mass of squares. If you're lucky or can aim accurately enough, you can potentially get all the balls 'trapped' back there and they can wreak all kinds of havoc. Expect trajectories to change. As you get further and further you'll find yourself firing off more and more balls in a single shot. This means that you're probably going to end up clearing whatever you're initially aiming at before all of them have hit, which will cause any balls that are still on that original path to hit things a bit differently. This isn't a bad thing, but it is something worth accounting for as it may help you in the long run. Ballz really took me by surprise. I went in expecting something simple and dull but found a really interesting (and fun) approach to a genre I haven't touched in years. It's good stuff, and it's well worth checking out. Call it a holdover from the 90s, but I tend to be wary of anything with a name that replaces 'S' with 'Z.' It makes me expect over-the-top Rad and Tubular imagery that's often used to distract from mediocrity. Hey, the 90s were a strange time. Ballz isn't that, thankfully. Yeah the name is kind of eyebrow raising, but it turns out the game itself is quite the interesting twist on the classic 'brick breaking' genre popularized by Breakout, Arkanoid, and so on. 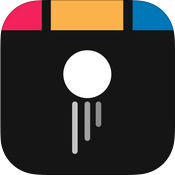 Ballz is essentially a brick-breaker that's been turned into a physics puzzle game. You have to launch a ball towards the blocks at the top of the screen in an attempt to clear them one turn at a time. 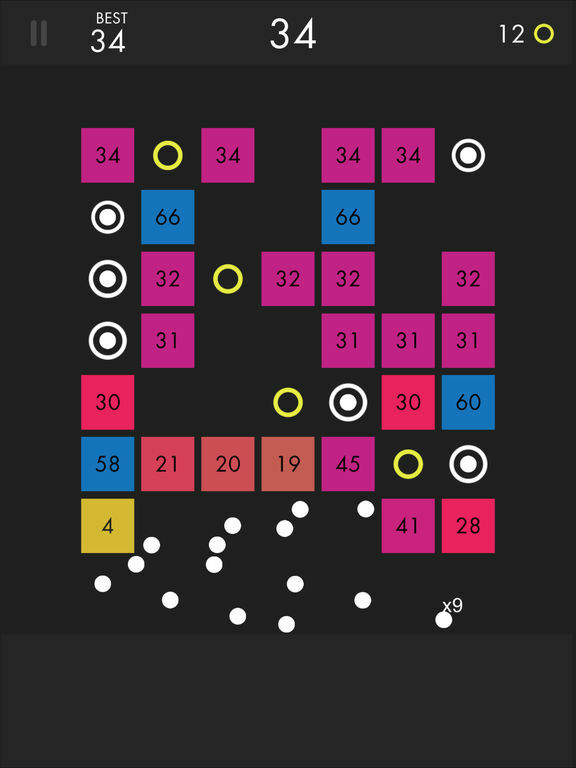 Each turn ends after the ball has been launched and then touches the bottom of the screen - after which every block still in existence moves down one space and a new row of blocks appears at the top. The blocks never stop coming. Each block has a number on it that indicates how many times it needs to be hit in order to remove it, thus making prioritization quite easy and obvious in most cases. I really enjoy this approach to brick-breaking, as it allows me to take my time while aiming and plan out how to approach a given setup. It's also weirdly strategic in the way that blocks can be intentionally cleared out to create paths to other spots where balls might get 'trapped,' thus bouncing all over the place and whittling down a bunch of blocks before returning to the bottom of the screen and ending the turn. On top of this, it's possible (essential, really) to collect extra balls between turns by hitting specific power-ups of a sort. So after several turns it's entirely likely to have dozens of balls bouncing all over the screen at once - clearing out blocks in a rapid-fire assault, creating new paths for other balls that then end up taking completely new directions, and generally creating some seriously pleasing to look at visual chaos. The one thing that bugs me about Ballz (aside from the name, naturally) are the ads. I mean I don't mind that they're in place because it's a free download and developers have to make money somehow. What I do mind is how they have a tendency to pop-up at really bad times - like when I'm about to tap the screen in order to start aiming or right after I launch balls (so that they completely obscure whatever is happening on-screen). Aside from the occasional annoying ad and the unfortunate title that makes me think of cheezy 90s junk, I really like Ballz. It's a smart and enjoyable twist to a familiar concept, with the added bonus of being fun to watch once things start to get hectic.